This almost abstracted image uses a muted and modern pallet of cool blue, mustard yellow and puce. 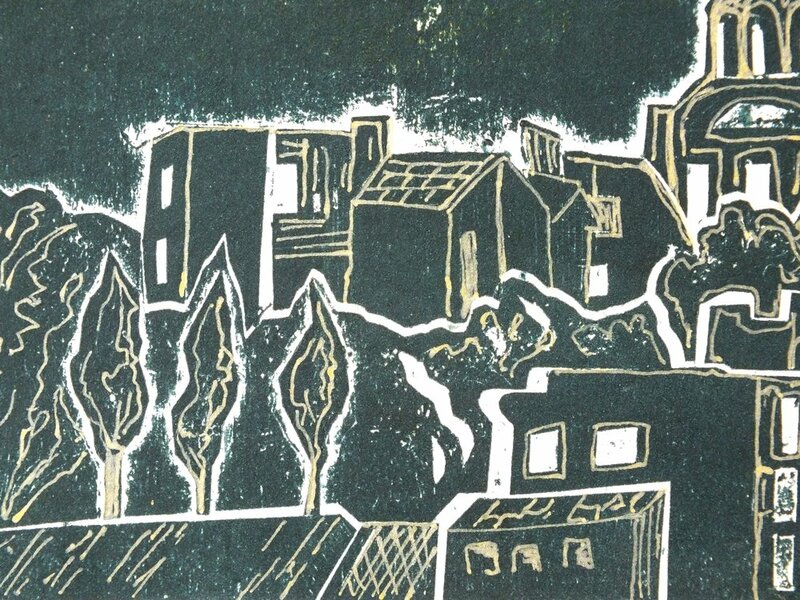 Green Belgrade Skyline Collagraph with Gold Pen. This print was created using card as a plate. I cut the design into the card, varnished it and then inked it up with a roller in rich bottle green. Then I ran the card through the press with damp Snowdon quality cartridge paper. Once dry I added the finishing touches with gold pen. 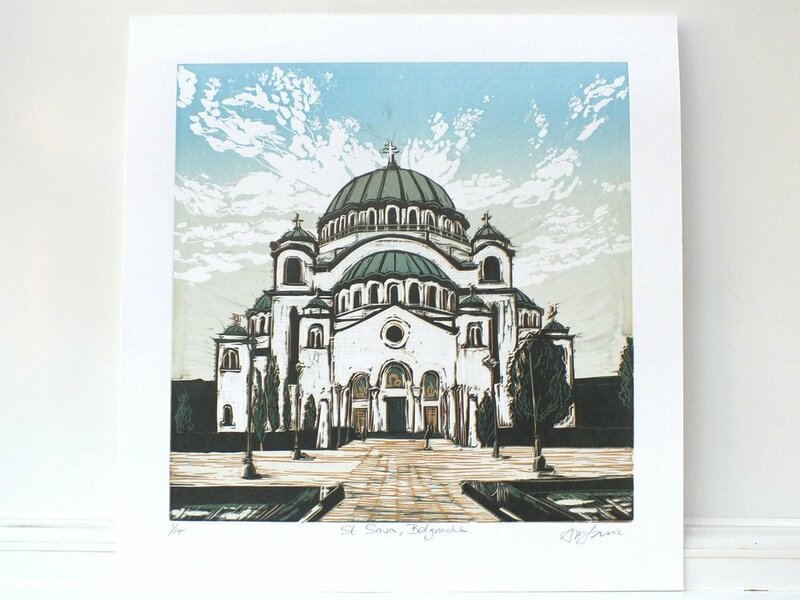 Saint Sava Church in Belgrade is one of the biggest Orthodox churches in the Balkans. The dome weighs 4,000 tons and was built on the ground. The building was finally completed in 1989, but work still continues inside the building. It's a stunning and imposing Cathedral in the heart of Belgrade, Serbia. This is a reduction technique linocut and is number 1 of a variable edition of 14 original prints. The edition was completed using different colour ways, which change the mood and atmosphere of the subject. This is a reduction technique linocut and is number 5 of a variable edition of 14 original prints. The edition was completed using different colour ways, which change the mood and atmosphere of the subject. I visit Belgrade, the capital of Serbia, with my family at least 2 times a year and we love to visit St Sava Orthodox Cathedral. It's a stunning and imposing building, which is yet to be completed. Its symmetrical shape and the simple gardens leading up to the church make it a very peaceful place to spend time. 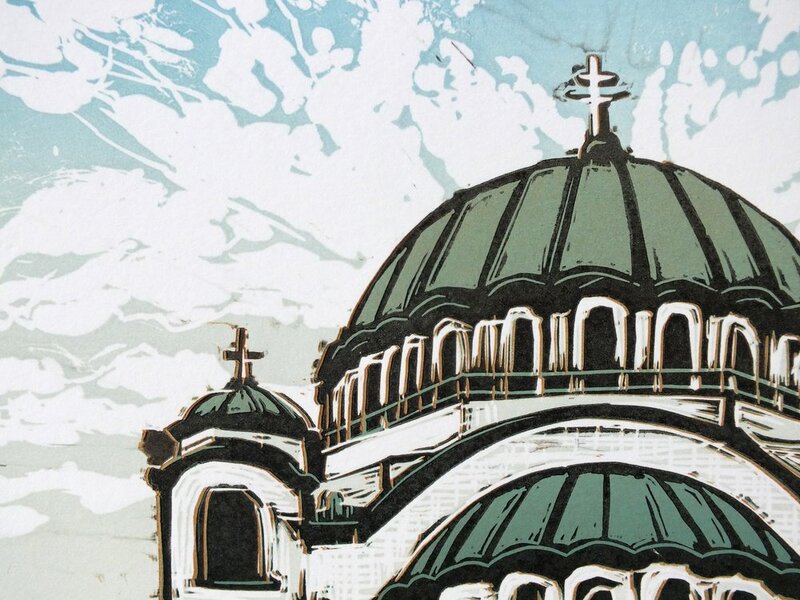 A hub for worship and culture in the heart of Belgrade's bustling metropolis. This is a reduction technique linocut and is number 7 of a variable edition of 14 original prints. The edition was completed using different colour ways, which change the mood of the image. This version has a green tinge to give a cool atmosphere. This is a reduction technique linocut and is number 14 of a variable edition of 14 original prints. 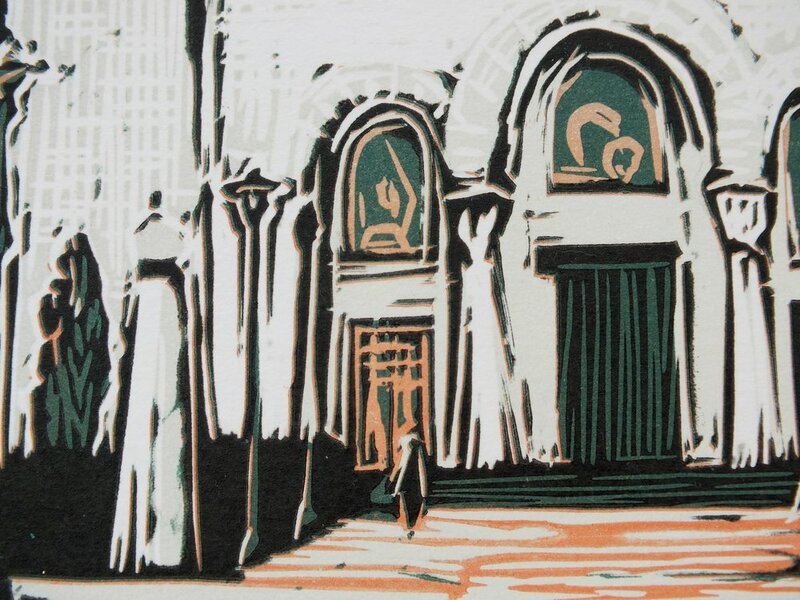 The edition was completed using different colour ways, which change the mood of the image. Exeter Cathedral, floodlit at night makes for a stunning example of Gothic architecture. Exeter is the regional capital of Devon in England and is steeped in history. 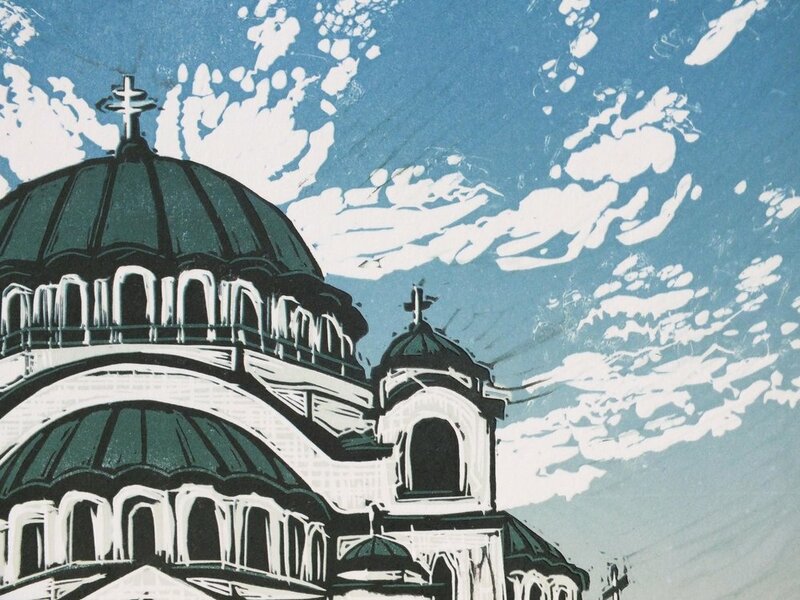 This is a reduction technique linocut in 4 colours, finished off with midnight blue to set off the beautiful creamy coloured stone. All my prints come UNFRAMED, but this print comes with a mount.